Chaplain Nancy Penton is the Director of Spirituality at Signature HealthCARE of Buckhead where she facilitates spiritual support and participates in chaplaincy interventions for residents, stakeholders, and their families. Nancy graduated from Mercer University McAfee School of Theology in December 2007. Nancy was ordained by her local church, Atlanta Vineyard Church, where she serves as the Director of Prayer Ministry. 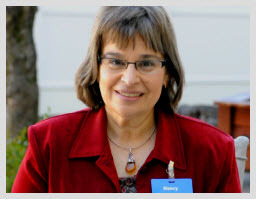 Nancy is a second career chaplain, having worked in healthcare in the clinical laboratory prior to seminary training. In 2010, Nancy accepted an invitation to pursue a Doctor of Ministry in Christian Spirituality at McAfee School of Theology. Nancy has an affinity for mentoring others and learning spiritual practices. Nancy and her husband, Allen, love to travel to various parts of the world. Allen and Nancy have three grown and married sons. Nancy loves to teach, sing, play the flute, and camp out in the beautiful state parks of Georgia and Tennessee.